The most important piece of the puzzle when it comes to retaining your best employees is the onboarding process. Because first impressions count for everything. If you give your new employee an awful first day, they’re going to regret their choice to accept your offer instantly and have their formative time at your company tainted with bad feelings. 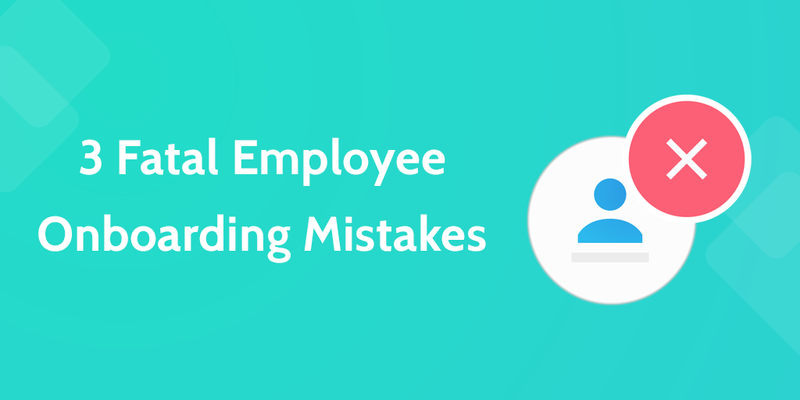 In this quick reference guide, I’m going to outline the 3 most fatal mistakes you can make while onboarding new employees, and give you solutions. The best employees — e.g, the ambitious ones — start a new job because they want to expand their own personal set of skills. If your new hires feel like they’re being put through a series of the dullest tasks you could imagine, they’re going to get a bad first impression. When employees feel like it’s important to you that they’re growing their set of skills, they’re going to be more engaged and less inclined to leave. That’s why Google has set up an employee-to-employee learning initiative. And, since hard-working and ambitious employees are always keen to soak in new information and skills, it will keep your best performers motivated right from the start. The first project your employee is involved with shouldn’t be trivial. It should be an important project where they’ve given the chance to shine. Allocate a little time every week for your employees to work on their own projects. This increases motivation in the same way taking a vacation brings you back to work wth a fresh attitude. The downsides of paper are overwhelming. Sure, when it comes to sketching down a few ideas on the fly, a paper notebook might be a good option, but formalizing your SOPs on paper is a recipe for disaster. And, when you’ve got your process all written down, it’s not indexed and searchable. That means that you aren’t able to hit CTRL+F and drag up the correct passage. You have to get up, walk over to the filing cabinet, rifle through the folders and find the exact page you need. It’s this sort of thing that literally wastes days out of your employee’s work years and ruins efficiency. Use an electronic system to manage your processes, like Process Street. Process Street is simple SOP software that lets you add your team, track process activity and communicate over checklists in a streamlined and efficient way. With an electronic workflow, you can also automate tedious parts of the process, like form filling and welcome emails. If your employees aren’t sure exactly what their targets are, or how much they’re expected to get done in a week, there’ll be confusion and frustration. When you explain in clear detail what you expect from an employee, they’re able to block out their time and train themselves to boost their own productivity. Not only does this mean they’ll become more efficient over time, but it also means they’re able to figure out whether or not they’ve done a good job. There’s nothing more demotivating than getting to the end of a week and having no idea whether you’ve met expectations, so explain exactly what you need from the outset. A content writer is expected to write 2 x 2000 word articles per week as their main output. When you’ve got these expectations down, it’s going to be much easier for employees to feel motivated that they’re doing you proud and making an impact. The worst thing a new employee can feel is that they’re overlooked and superfluous. Setting goals and checking in with them (gently) will help overcome this. The trick to quality employee retention is top-notch onboarding. What does that mean for your company? Well, if you’re not managing to retain the top talent, you need to make big changes. The bottom line is that employee onboarding is a process. It should be refined and developed over time, taking into account best practices. For a great starting point check out this customizable employee onboarding checklist, which will give you everything you need to get off on the right foot with your new hire. Very awesome and helpful post. I made some of these errors in my early days in business.